A consultation is required to find out if you are suitable of any of the following treatments. Most Prosthodontic fees are tax deductible. See here. All pricing for implant dentistry includes both the implant placement and the restoration. 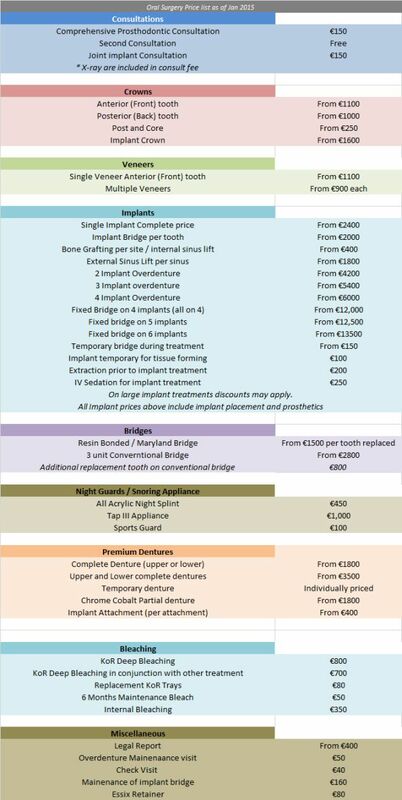 The list below is not exhaustive, each treatment plan is individually priced and you will receive detailed breakdown of all fees before treatment. All treatment is done by a specialist prosthodontist and specialist oral surgeon. All laboratory work is of premium quality materials and workmanship.